A number of patients desire improvement in the appearance of a poorly defined, underprojected chin. A strong chin can help add definition and balance to the other facial features. For patients who desire a non-surgical solution or are interested in seeing potential results before undergoing surgery, chin augmentation with filler is an excellent option. There is an art to a liquid chin augmentation. The injector must understand not only the anatomy of the chin, but also the three-dimensional contours presented by the soft tissues and underlying skeletal framework. The chin is one of defining features of the face, giving shape to the face, and neck as well. And with aging, the chin tends to lose volume and projection. Fortunately, a natural chin enhancement can help to return the chin to a more youthful state without looking ‘fake’ or unnatural. Dr. Ryan Greene is a master injector who understands the art of chin augmentation. After thousands of filler injections, he is a respected authority on facial fillers, serving as a national trainer for Allergan (the makers of Juvederm and Voluma). His goal is always to create natural and long-lasting results. Even with a modest amount of filler, the chin can have a noticeable improvement. This can also help to define the jawline, and in many cases, provide the patient with a more tightened look to their neck. But even for patients who simply desire some forward projection of their chin, filler can provide impressive improvement. 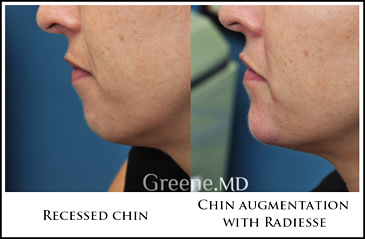 Juvederm Voluma and Radiesse are common fillers used by Dr. Greene for treatment of the chin. Depending on the patient’s desires and their facial features, Dr. Greene will select a treatment plan to create a well-defined chin. And while many patients assume that these treatments are painful, discomfort can be virtually eliminated with Dr. Greene’s specially formulated anesthetic cream and injection technique. Juvederm is a facial filler made up of hyaluronic acid, a naturally occurring substance that helps to bind water to cells. Juvederm Voluma is a very cohesive filler that is an excellent choice for areas like the cheeks and chin. It has also been shown to last up to two years in clinical studies. Like other hyaluronic acid fillers, it appears smooth and natural when placed in the chin. Radiesse is comprised of calcium hydroxyapatite. It is an excellent filler for areas such as the cheeks and chin. Radiesse creates a natural result that lasts for approximately six to twelve months. WHAT TYPE OF ANESTHESIA IS USED FOR LIQUID CHIN AUGMENTATION? Most chin enhancement procedures are performed with topical anesthesia. There is typically minimal pain associated with chin augmentation. WHAT IS THE EXPECTED RECOVERY AFTER CHIN AUGMENTATION? Some minor swelling is expected, which usually resolves within one to two days. A small percentage of patients will also develop minor bruising that can usually be covered with makeup. Patients should avoid exercise for twenty-four hours after the procedure to minimize swelling. Otherwise, patients can resume work and normal activities. WHAT IS LIQUID CHIN AUGMENTATION? Liquid chin augmentation is an office-based procedure that enhances the appearance of the chin and lower face. Materials most commonly used for these procedures are Juvederm Voluma and Radiesse. Patients who seek chin augmentation have a desire for more chin projection with better definition. By adding volume to the chin and lower jawline, the skin below the chin is also tightened, often improving the neckline as well. WHO IS A GOOD CANDIDATE FOR LIQUID CHIN AUGMENTATION? Any individual who desires improved chin shape and projection may be a good candidate for chin augmentation. Patients who would like to avoid surgery or an implant, but would like to improve the appearance of their chin, would also be good candidates as well. WHY CHOOSE DR. GREENE FOR MY CHIN AUGMENTATION? HOW DO YOU AVOID AN UNNATURAL LOOKING CHIN? Creating a natural appearing chin requires artistry, good judgment, and excellent technique. Dr. Greene takes pride in creating natural appearing filler results, and is sought by patients throughout Florida for his chin augmentation procedures. HOW LONG DO THE RESULTS OF CHIN AUGMENTATION LAST? The results of liquid chin augmentation vary from patient to patient. However, in experienced hands, the results should last at least nine to twelve months, or even up to two years in some cases.